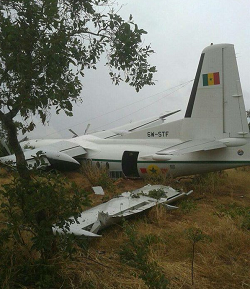 The aircraft was destroyed in a forced-landing outside any airport on a flight to Dakar. There were no fatalities but a number of injurted persons. 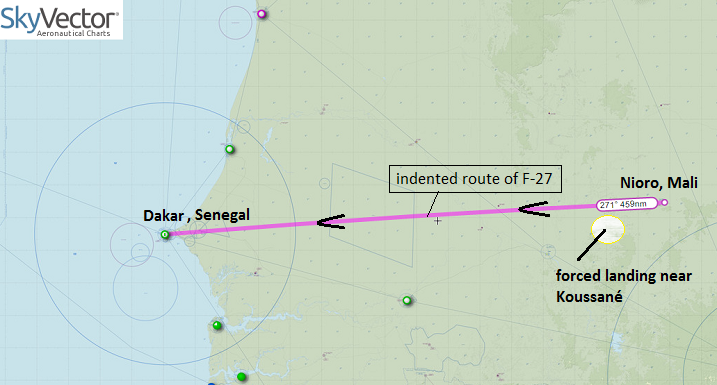 Due to yet unknown circumstances the turborprop aircraft was damaged beyond repair in an off-airport landing on its way damage in a forced landing accident near Koussané, Mali. The pilots landed in on uneven terrain in a field , before coming to rest the left outer wing hit an obstacle and broke off . 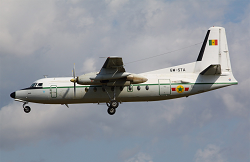 The Fokker was rented by two malian businessmen for this flight. All crew were able to walk away from a forced landing accident during a fire fighting run in Laconia, Greece.